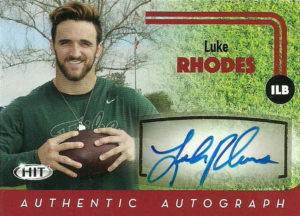 Luke Rhodes played inside linebacker at William & Mary- not exactly a powerhouse of football. But give credit where credit is due. He did manage to land on the radar of scouts finishing with 341 career tackles (5th in school history) from his inside linebacker position. Rhodes passed the eyeball test but what some teams coveted from him was his long snapping capability- something that he seldom had done since high school. After the 2016 NFL Draft, Rhodes signed with the Tampa Bay Buccaneers, however he was released during final cuts. He’d be signed by the Colts about a month later and added to their practice squad. In 2017, Luke won an open competition for the job and became the Colts full-time long snapper.